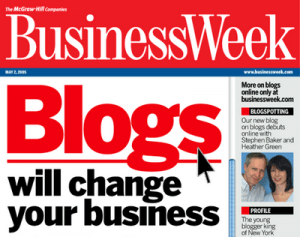 Remember this headline from Business Week? Nine or ten years ago, businesses, newly being able, because of the emergence of what we called “Web 2.0 platforms”, to have a dialogue on the web, rather than an expository monologue — read, purely “brochure-ware” websites — began to participate in one of the most impactful-ever professional paradigms. We were able to make business “social” and “human,” rather than purely controlled and measured. Moreover, however, we could express the “voice” of our brands to a readership and readers and followers, who were, of course, customers and prospects could… respond. Instead of waiting solely for focus group, postcard, editorial and other traditional feedback on our products/offerings, services, our corporate culture, and, again, especially, the voice of our own people — our company executives, our thought-leaders, our brand ambassadors, etc. — the public could directly, immediately, tell us what they thought. This gave us a rich repository, unexpected at the time, of content (massive, for large and/or popular brands) to use to really understand our audience/customers, and to report back to shareholders, top executives, other investors, stakeholders and business partners, and publications and associations. All of the above, of course, came with risk, with ugliness alongside of the good, with tons of useless content — both to us/the brand(s) and our/their audiences — and, more frightening than all, the emerging world of “Bloggers” who knew more than the executives in businesses about how to utilize the then-new platforms to communicate with the public, but had not been vetted for their capacity, and propensity, to serve as the “voice” of a brand, a company, a division of an organization, or of our, or our shareholders’, commercial interests. Blogging extended our brands, humanized them, and created voices of authority (“thought-leadership”), but, soon after, created a large, in many ways, out of control deligitimization of those voices, and, again, a great deal of noise. Soon afterward, Social Media appeared, wherein turning social platforms (also) into opportunities for company and brand extensions started, and the phenomenon of “microblogging” began. Instead of reaching out through “substantive” — read, longer — Blog posts that required/still require time and focus to write, companies/brands were/are able to express their ideas, “professional emotions,” thought-leadership, and moreover, invite response, in far less characters. We at Mitra Creative know that we’ve been “away” from our own Blog for a while. We’ve been busy–spending more time extending the messages of the brands and companies that we represent through Blogging, microblogging, and other programs, than on ourselves. But we’re back. We have things to say. Stay tuned!